This is going to be a kind of long post because so much has happened in the last few weeks! I’m going strong in school this semester. I have an historical architecture class that I’m obsessed with!! Life has gotten crazier so a few less adventures with friends but we’re still trying. Okay, that’s just a small snippet of what’s going on. Now for the real meaning of this post: I’m still head-over-heels in love with best friend, Richard! It’s crazy to think that we’ve only been dating for three months and “known” each other for four! I didn’t realize that I was missing a part of me until I found him. I know, I know… Another post about this guy? What? But guess what! I’m going to marry him!! AHHHHH! Wait, stop! I’m getting ahead of myself. That’s the middle of the story… About a month ago, Richard was getting really serious about moving down to Utah. He didn’t feel like there was anything in Pocatello anymore. Even though he had family and friends there, he wanted to leave. 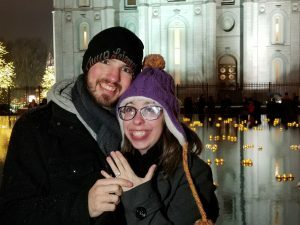 He had been thinking about moving to Utah even before we met, but as we fell for each other, the more he wanted to move. We prayed about it and received complete peace about the decision. Now he had to look for a place to live….and a job. He after weeks of coming up dry, his sister sent him a link to a promising idea. He applied and got called in for an interview at an APARTMENT COMPLEX in Midvale (about 20 minutes away from me!). P.S. that was the interview he had that week of Thanksgiving. The interview went really well and they basically hired him on the spot! 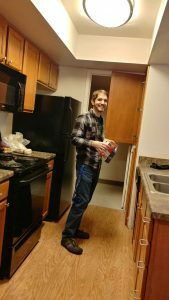 On top of the job offer, they also offered to give him a discount on a one bedroom apartment so he could live on the property. Hooray!! The day he moved, I went to meet him with Gillian, Ashley, and Brad. I was so excited I couldn’t sit still the whole day. I felt like I was going to throw up, pee my pants, cry hysterically, and giggle to death all at the same time…totally in a good way! We had made a plan to help him move in so he knew we were coming but he didn’t know when. I wanted to surprise him, so I had him text me when he got there so we would be able to be there by the time he was done signing papers and stuff. Before we left, we ran to the dollar store where I bought one single balloon and his favorite treat. We got there and he was still busy. I jumped out of Gillian’s car, grabbed my stuff, and sat on the back of his car. About ten minutes later, he still hadn’t showed up and it was really cold. I didn’t want to get back in the car so I casually walked over to the driver side’s door on his car and tried to pull the handle. Luckily, it was unlocked, so I climbed in! Ashley called me and I talked with her and Gillian while we waited. (Brad had decided that he needed to wander so he had left.) A few minutes after that I see Brad’s head and Ashley is giggling. I ask her if Richard is with him. (His care was still packed with stuff so I couldn’t see out of the back window.) I was totally just going to snuggle down with all the stuff until he opened his car door but I was way too excited so I popped out of his car and ran down the parking lot. He was here!! It’s been so fun to see him pretty much everyday. We have gotten so much stronger as a couple. We’ve been reading scriptures, saying family prayers, and going to church together. It’s been such a wonderful experience to grow that way together. 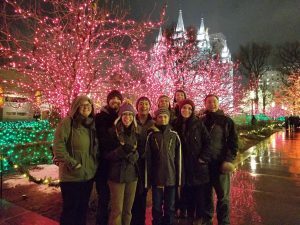 About a week later, my parents had planned to come to Salt Lake and go see the lights. Of course, we were invited to come along. One night he asked me if his aunt could come to take pictures of us while we were there. Confused, I told him that almost everyone that was going to be with us had a phone that we snap pictures on. He told me no and that he wanted professional pictures. Um, excuse me what?! I totally knew something was going on… We had gone ring “looking” a few weeks before, he kept talking about getting married, and now this. I made a joke one day about us being “practically engaged” and he said, “it’s coming soon.” I freaked out! Soon means so many different things to different people. Haha! Something was definitely up. Okay, so that side note was clear back October! We were starting to talk but not very urgently but with this “we need professional pictures taken when you’re family is here” attitude he had, I was getting so anxious. The Saturday came and we had a wonderful day. The whole family got to come, plus Ashley too! (I mean she’s basically family so it was fun to have her there too. Hehe.) We had spent the afternoon in Lehi with Grandma and Grandpa and then went to see lights. Richard was acting funny all day… He seemed nervous but happy. I could tell he had a plan about something. When we got to Temple Square, we wandered around for a while before he suggested we go over to the reflection pool. Guys, we were taking pictures one second and then the next he was down on his knee!!! He told me he was so grateful for Heavenly Father’s love and how much He must love him to allow him to be able to love me as much as he does. He told me that he falls in love with me all over every day. It was just such a sweet proposal. Obviously I said yes, but it took a minute because I was crying and smiling so hard. 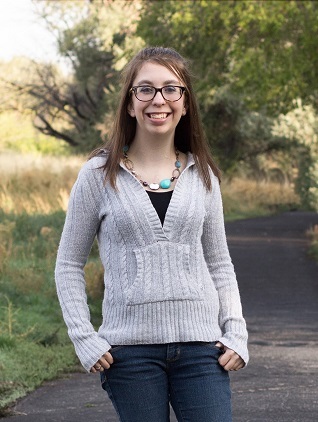 It was so special and I can’t wait to be sealed to him for time and all eternity! !